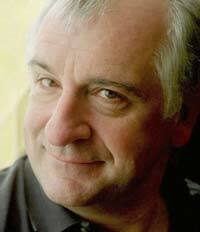 Douglas Adams was an English author who was most famous for his series of novels, The Hitchhiker’s Guide to the Galaxy. This, in fact, began life as a radio serial, only later making the transition to print. Adams also wrote an unfinished series of humorous detective novels starring Dirk Gently, as well as several scripts for Doctor Who. He was a strong supporter of environmental causes, in particular the conservation of the endangered mountain gorilla. Adams lived just long enough to see some of the ideas he had used in The Hitchhiker’s Guide become reality with the advent of the internet. Adams was born in Cambridge in March 1952, and was educated at a boarding school in Brentwood. He quickly showed his talent for creative writing. Upon leaving school, he was accepted into Cambridge University to study English Literature. Here, he joined the Footlights comedy drama troupe, which later provided a number of stalwarts of British comic talent including many of the team behind Monty Python’s Flying Circus. Adams himself took a slightly different route, and although he had bit parts in Monty Python, he preferred to concentrate on his writing. Despite having achieved his degree, albeit with some difficulty due to his lifelong habit of being late with work, Adams initially struggled for recognition and money. In the spring of 1978, however, the BBC produced The Hitchhiker’s Guide to the Galaxy as a weekly radio serial. It caught the public imagination, and a second series followed two years later. The shows were re-edited to produce a novel, which was also a success, as was its sequel: The Restaurant at the End of the Universe. Although always advertised as a trilogy, Adams eventually wrote five books in the series, with a sixth being written by Eoin Colfer after Adams’ death. As he grew older, Adams became increasingly convinced of the importance of conservation work, and he undertook several trips to Madagascar with a friend in the 1980s and 1990s. These trips inspired a work of non-fiction, Last Chance to See, which was also turned into a radio series. Meanwhile, Adams was trying his hand at writing comedy drama outside the Hitchhiker’s universe with the 1987 publication of Dirk Gently’s Holistic Detective Agency. A sequel followed a year later, The Long Dark Tea-Time of the Soul, taking its title from a throwaway line in the Hitchhiker’s books, although the two series did not overlap. He was also very interested in new technology, becoming a pioneer in the use of email and what would later become known as blogging. Taking quickly to the new possibilities offered by the popularization of the internet, he wrote about his variety of interests, which ranged from guitars to atheism. Adams was the first Briton to purchase an Apple Macintosh, and remained a staunch supporter of Apple for the rest of his life. He died suddenly of a heart attack at age 49 on May 11, 2001. A collection of his unfinished and unpublished works, The Salmon of Doubt, was published a year later.